Yesterday, the Senate acting as an Impeachment Court decides to convict the Chief Justice Renato Corona on the Article II of the Articles of Impeachment that is the culpable violation of the constitution. The voting was unsurprisingly overwhelming with 20 senators voted for conviction and only 3 senators voted for acquittal in the person of Joker Arroyo, Bongbong Marcos, and Miriam Defensor-Santiago. I was not surprised with the verdict against the Chief Justice even though the evidences shows otherwise as most senators voted according to their political survival in the next elections in 2013 as they had to appease the overwhelming public sentiment for conviction of the Chief Justice or just they simply hate the one who appoints the Chief Justice, the former President Gloria Macapagal-Arroyo. Those who voted for acquittal are those who follow the flow of presenting the evidences throughout the trial, does not have any political aspirations past-2013, or simply hate the current President Noynoy Aquino. 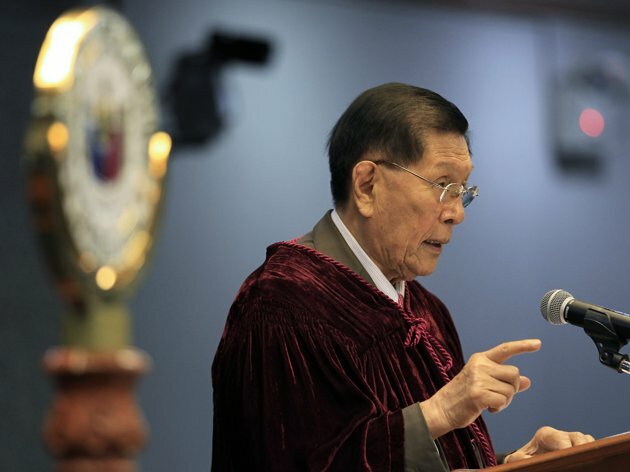 Realistically speaking according to my analysis when I watched the trial on TV, some of the senators like Chiz Escudero, Juan Ponce Enrile, Gringo Honasan, Manny Villar, or Jinggoy Estrada could have been voted for Chief Justice’s acquittal if not for their future political aspirations this coming 2013 elections. I think also that these 5 senators voted for conviction for simply pragmatic purposes of bolstering their political survival not just by themselves but by their heirs in political arena and also to avoid public backlash in a short-run. The conclusion of the impeachment trial of Renato Corona is not the end of the history of systematic corruption and impunity of our country as the present administration have to address the root cause of that systematic corruption and impunity in the government workplace by revising the flawed and bureaucratic-prone 1987 constitution. By reducing the capability of the government of indirectly stealing money of the public like high tax rates, massive red tape, massive bureaucracy, massive government intervention in economic decision making of the people, politician and elite’s encroachment in judicial decision making, and electoral fraud, for sure our country would have an economic and political renaissance and the people would be totally free from political intervention in a long-run. 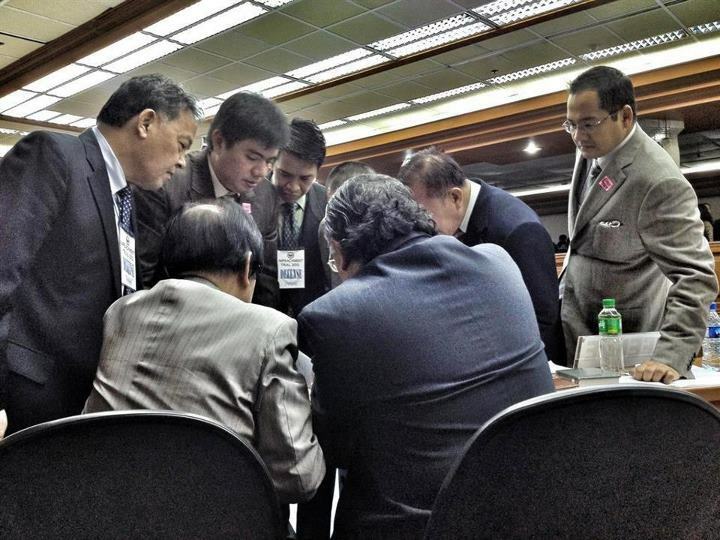 The defense team of CJ Renato Corona talking to each other during the oral arguments, 28 May 2012. Yesterday, the defense and the prosecution team of the impeachment trial of Chief Justice Renato Corona gives their summary of arguments on whether the Chief Justice should be acquitted or convicted based on the evidences presented by both sides after more than four months of trial. I am writing this blog entry to show my stand on this trial on whether the Chief Justice should be acquitted or convicted, I choose the former for this specific reasons according to the evidences presented and according to its legality or validity within the 1987 constitution. But these critics and the prosecution forgot on what it says on the last part of the paragraph on that section that states manner provided by law which a section of the constitution shall be supplemented by a statutory laws ratified by the Congress after 1987 or any statutory laws that was ratified before 1987 whether that certain law contradicts what a section of the constitution or not shall be still in force unless being superseded by a statutory law that conforms what in a section of the constitution says and in this case right now, the RA 6426 or Foreign Currency Deposits Acts was not superseded by any statutory law enacted by the Congress after 1987. The prosecution through Rodulfo Fariñas said RA 6713, the Code of Conduct for Public Officials and Employees clearly states that officials must declare “all other assets such as investments, cash at hand or in bank, stocks, bonds, and the like” however he and the prosecution team forgot that the previous law (RA 6426) imposes an absolute veil of confidentiality on foreign deposits that not even the Code of Conduct can force open therefore CJ Renato Corona is not liable because he believes in good faith on the absolute confidentiality of foreign deposits means that CJ Renato Corona merely follows on what the RA 6426 say and also the RA 6713 and that RA 6713 never really supersedes on what the absolute confidentiality provisions of RA 6426 says. In conclusion, the Chief Justice Renato Corona never committed an impeachable offense like non-disclose of dollar accounts to his Statements of Assets and Liabilities or SALN as that action never really comply on what the 1987 Constitution says on valid cause for impeachment likeculpable violation of the Constitution, treason, bribery, graft and corruption, other high crimes, or betrayal of public trust and also Renato Corona’s actions were guaranteed by a statutory law and therefore by the Constitution. Means that the Chief Justice Renato Corona should be acquitted. Renato Corona testify as a witness before the Impeachment Court. 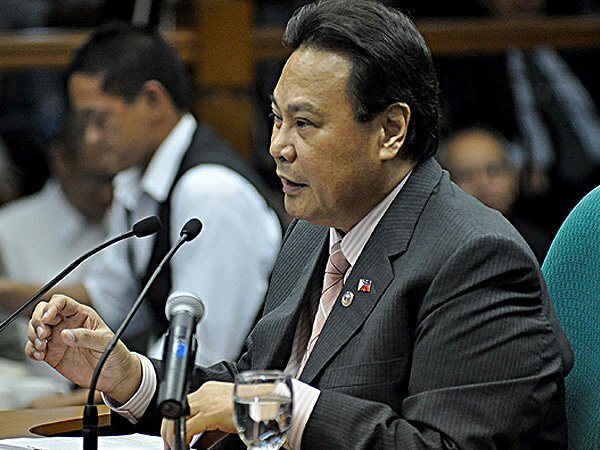 Last Tuesday, the impeached Chief Justice Renato Corona testify himself as a witness before the Impeachment Court. His testimony or rebuttal takes more than a hour to clear his name from falsified accusations being stoned to him by the prosecution. He states on his testimony that the administration of Noynoy Aquino uses their available resources to put down him. He states that we must not believe that this Impeachment Court is against corruption because of being somewhat tolerant of the prosecution’s fraudulent ways of presenting the evidences. He states also that his impeachment is based mostly in hatred and vengeance by a single person (he refers to the President Noynoy Aquino). He condemned on what he considered as partisan politics as this administration tends to in favor to their close friends and benefactors during last election season in terms of making appointments in certain government positions. Also in a part on his testimony, the Chief Justice condemned a certain senator who naked him in front to the public. He condemned his critics on being a suspicious of his wealth that being generated for many years as a practicing private lawyer before he entered in the government in late 90s and states that his wealth was gained through hard works. He states also that his life is rather simple and doesn’t have a maid in their house. He condemned the prosecution team of butchering the Constitution to destroy his life and his family like presenting a forged and fabricated evidences or using black propaganda before the media. He also states that the Supreme Court’s decision to redistribute the Hacienda Luisita last November was the reason of his impeachment (confirms my suspicion that his impeachment was because of that decision) as the timing of his impeachment coincides the HL’s decision. He also states the irrelevant Basa-Guidote properties also nothing to do with him and never invested it contrary on what the prosecutors and the Basa family states. He also condemned that the alleged 45 properties named to him as a fraud. He states that he only owns 5 properties named to him. He states also that he has no properties abroad contrary to what a journalist says and considered her as a liar. He also condemned that he has 82 bank accounts with the total worth of $12 million as a fraud also. He states that he has only 4 bank accounts named to him and only amounted to $2.4 million. He also condemned the AMLC report presented by Ombudsman Conchita Carpio-Morales as an unauthenticated and consider her testimony as a misinterpretation. He also signed a wavier to open his dollar account to the senator-judges with a condition that the 188 representatives and a senator will sign it first to open their dollar account to the public. Before the cross-examination by the defense to CJ, he suddenly left the witness stand therefore the Session Hall of the Senate as he cannot take the stress of more than a hour to refute the case of the prosecution and suffered a low blood pressure or hypoglycemia. Many critics considers as a “walk-out” but that was not the case as CJ Renato Corona returns to the Session Hall with a wheelchair and states through his defense lawyer, Serafin Cuevas to return to testify by Friday which the CJ did. Well, his testimonies confirms on what my suspicions the cause of his impeachment that is to maintain the ownership of the Hacienda Luisita by the accuser, the Cojuangco family through Noynoy Aquino. I also believe that the evidences stoned to him by the prosecution are just baseless, unrealistic, and fabricated just to vilify the Chief Justice because he was just an appointee of the previous administration. I also believe that those to accused him maliciously of owning a 82 dollar accounts to sign the waiver and show their dollar accounts to the public to be fair. I believe also that the entire impeachment trial is railroaded by this administration in order to achieve what they wanted, the total control of all branches of the government. In the end of the day, the Rule of Law shall prevail in the verdict this coming Tuesday by the Senator-Judges not their respective political survival this coming 2013 and 2016 elections. If they abide with their political survival, our country would be going to the path of the dicatatorship. I not a fan of Lady Gaga’s songs but what some “Christian” zealots wanted to suppress her is outrageous. As of this writing, a concert of Lady Gaga, the most popular pop star of generation and known for her provocative style, is currently held at the SM Mall of Asia in Pasay not just only today but also tomorrow May 22. The concert of Lady Gaga creates mix reaction from her fans and also from her critics especially from the conservative factions of Christianity in the Philippines. According to her fans, Lady Gaga shows her talent on how she provoke the minds of her fans like her albums “The Fame“, ” The Fame Monster“, “Born This Way” and others. According to her critics, Lady Gaga’s performance and her songs shows how she mock the Christianity like acting her as a Mary Magdalene on her song entitled “Judas” and also of her frequent usage of vulgar words which is unacceptable to the younger audience and especially to conservative audience. Although I’m not really a fan of Lady Gaga but what these bigoted some “Christian” zealots wanted to stop her to perform her concert is outrageous because at the first place, they’re hypocrites on their own words as they tend to judge her songs according to its initial appearance not the entire message of the song. I think these people needs to awake themselves that this generation have different perspectives on what morality is and forcing anyone to impose your personal morality standards is disgusting and prevents anyone to think critically on what they express or they like certain views. Therefore, there’s no enough reason to stop her concert and let the audience themselves to decide individually on whether her songs is good or bad not by forcing her fans to boycott the concert nor forcing the performer to cancel her appearance in front to her fans. Anastasia Romanov during her youth years. I think these delusional claims about Anastasia’s survivability after 1918 must be stopped once and for all as scientific evidences shows the clear picture that she was executed by the Bolsheviks. 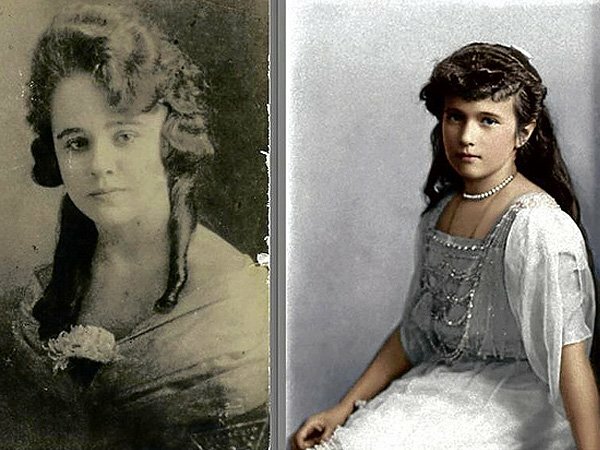 Last Sunday morning, I was stunned when I read the online portal of the Philippine Daily Inquirer states that a certain Caty Petersen is claiming herself that her grandmother is the late Anastasia Romanov, the youngest daughter of former Nicolas III of Russia. At the time when the Romanov Family was executed in 1918 by the emerging Bolsheviks, who later ruled Russia for the next 73 years, Anastasia presence was subject to suspicion on whether she was survived and escaped or not. A few years after the Romanov Family was executed, a certain person (most notorious case) named Anna Anderson claims to herself that she was the Anastasia Romanov who escaped from Bolshevik’s raid and fled to the United States (many Russian [includes the Jews] who supported the Romanov Family or just opposed the Bolsheviks escapes to the United States). Her case drew to much attention not just from the American people but also from the German aristocracy (that Anna Anderson really originated and the Romanov Family was closely related with the German monarch through marriage). After for many years, the German courts ruled that she was not the Anastasia and the DNA test confirms that after her’s death in 1984. That claims of Anatasia’s survival doesn’t finish there as in 1963 a certain person named Eugenia Smith claimed to her autograph entitled Autobiography of HIH Anastasia Nicholaevna of Russiathat she was the Anastasia Romanov similar to Anna Anderson’s claim. Like Anna Anderson, she was also an immigrant from Eastern Europe who escaped from the horror of World War I. She gained a much of followers to her claim as she stated that she was born in Saint Petersburg, the then capital of Russia in 1901 although real and reliable records says that she was born in Bukovina, which was under then Austria-Hungary and now divided between Ukraine and Romania. Her claims caught attention to one of the genuine relative of Anastasia in the person of Prince Rostislav Romanov, first cousin of Anastasia. As she knew that her claims, was false ones, she tried to distance herself from her earlier claims of Imperial origins. When she died in 1997, many newspapers published her obituary using Anastasia’s birth-date, or stated that she had been born in St. Petersburg which in reality was not. In 2008, after 90 years of mystery, Russian scientists confirms through DNA testing that the remains they recovered was the remains of Anastasia Romanov and it was proved once and for all that Anastasia was executed together with her family by the Bolsheviks. Last Sunday, when I read that news through the online portal of the Philippine Daily Inquirer the claims of a certain Caty Petersen that her grandmother was Anastasia Romanov, she stated that her grandmother escaped to the Philippines when she was 18 in 1918 then her grandmother, the alleged Anastasia Romanov according to her was brought to a monastery or orphanage somewhere in Manila and stayed with the nuns until her grandmother met a certain wealthy spinster named Lope Pelayo, her grandfather. According to her, her grandmother refuse to marry her grandfather until his grandfather was in the deathbed in 1964 and her grandmother decides to marry him and a family friend in the person of former Mayor of Manila, Antonio Villegas, intervened and informed her that none of her children would inherit anything if she did not marry him. I believe that her story is one of the handful of claims about Anastasia’s survival post-1918 that was really debunked in 2008 and my advise to Caty Petersen to stop her delusional claims that her grandmother was Anastasia Romanov and I think this story would not going to gain an attention to the genuine relatives of Anastasia that includes the British, Spanish, Danish, Norwegian, and Swedish royal families. Yesterday morning, the Philippine public has shocked with a brawl at the Ninoy Aquino International Airport-3 baggage section between between newspaper columnist Mon Tulfo and actor Raymart Santiago. That accident happened according to reports when Claudine reprimanded a Cebu Pacific flight attendant about her missing luggage. Then, she spotted a man taking a video of what was going on. Then Raymart confronted the man, who turned out to be Tulfo. Raymart reported that when he approached Tulfo to confront him, the columnist retaliated by punching him. It was taken through a camera of a certain private citizen (video above from Youtube) that Mon Tulfo was retaliated in return with fist not just by Raymart but also Claudine and their other companions and the airport security cannot even control the situation and that area, there was no CCTV camera installed. OMG NAIA management! Both sides have different accounts on who’s the one who started the skirmish but most reports said that it was Tulfo who started to physical skirmish however the side of the Santiago couple retaliate many times against Tulfo and then Tulfo right now is suffering the injury on his face. That brawl should have not been happened if the both sides never makes any foolish actions like for example Tulfo’s trying to mediate the confrontation between Claudine and a flight attendant of Cebu Pacific with Tulfo allegedly using a camera to cover that confrontation or Claudine never shows her “palengkera” attitude of reprimanding a flight attendant then joining the entire brawl between Raymart and Mon instead of stopping them. The lesson of this accident is to be more humble, patient, and diplomatic on dealing someone else. Demanding something that almost impossible to be given by the businesses and the government. 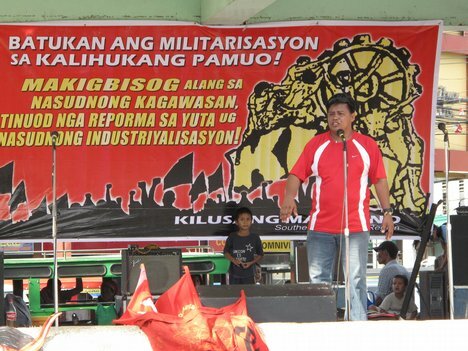 Today May 1 here in the Philippines and other countries is celebrating the day of the workers. It is very obvious for the many years that the workers are fighting for a better pay of their works however some of their demands are unrealistic and cannot be given away by the employers and by the government for simple reasons. For more than two decades, labor union groups sought a legislated wage increase of Php125 basing to the forces of inflation instead of productivity, no wonder that the Philippines has the highest labor cost in Asia that turns off businesses especially foreign to set-up here in our country which results to fewer jobs to millions of Filipinos. Labor union groups never think the implication of increasing the daily wages to Php125 would result to higher inflation which means higher prices for basic goods and higher prices for services while the productivity side is stagnating due to our anti-business environment. I am not against to any wage increases however increasing wage should not make the businesses, the consumers, and the workers themselves more problematic in a long-run. Wage increases should reflect to total factor productivity of our economic cycle not though the price inflation as a basis of wage increase. Minimum wage system that decided by the government is just killing small-scale businesses while benefiting the larger ones which is stiffing competition. Stiffing competition in the job market results to fewer job opportunity options to anyone and thus tends the wages to stagnant. To have a better wage increase in a long-run, we must market forces to dictate how much the wages should be received by the workers and to achieve that, we should let real competition to exist in the job market by creating more business-friendly laws like letting investors especially foreign to set-up freely without much restrictions from the government. Having a real competition would force each companies who are existing right now to increase the wages of their workers in order to maintain their workers from competing companies. So, in celebration of Labor Day, we must encourage our government to create more business-friendly laws so that more workers can choose their options for high-paying jobs.